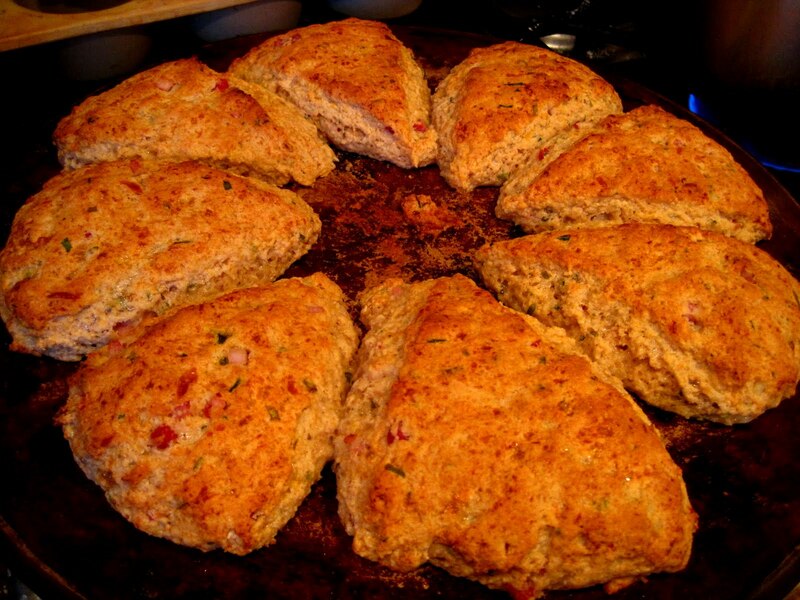 I decided to make a batch of savory scones for lunch today, but I'm not sure they'll make it to lunchtime untouched. Preheat oven to 400. Mix all of the dry ingredients in a bowl. Add wet ingredients and cut with a pastry knife until it comes together in a ball. It will be moist. Turn the ball out onto a baking stone. Press down to form a circle. Cut into 8ths and pull the pieces apart slightly. Bake for 20 minutes or until firm to the touch. 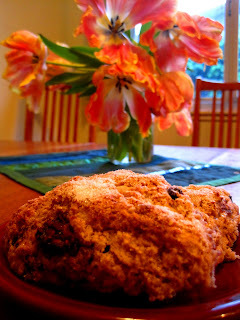 Scones are my easy get-up-and-bake breakfast treat; and I especially love that it's on the table in less than 30 minutes! Mine are, as usual, not typical, but they are tasty...and super easy. That's the base. Then add whatever ingredients you wish. These are fresh blackberry and dried blueberry. The second batch from this morning are candied ginger and bittersweet chocolate. Use your imagination! Preheat oven to 400. Mix all of the dry ingredients in a bowl. Add wet ingredients and cut with a pastry knife until it comes together in a ball. It will be moist. Turn the ball out onto a baking stone. Sprinkle with ground almonds and press down to form a circle. Cut into 8ths and pull the pieces apart slightly. Sprinkle tops with sugar and bake for 20 minutes or until firm to the touch. 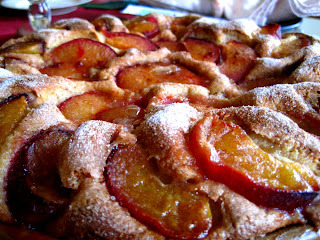 No bakery or store bought plum cake, no matter how beautiful it looks, can ever compete with a fresh home baked and warm from the oven, Hungarian Plum Cake. 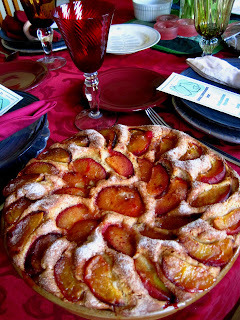 This cake is beautiful to see, the rich purple color of the plums develop and glaze with the sugar and cinnamon while baking. Heat milk to scalding, then add butter and 1 1/2 Tbs of sugar, stir well until butter and sugar are dissolved.In small bowl, add yeast to water, with the other 1 1/2 Tbl. of sugar. Put 2 cups of flour in large bowl and add cooled milk, yeast mixture, eggs and salt. Beat well. Add the additional flour and work until dough comes away from sides of the bowl. Dough should be very soft and sticky. (If too thick, add a few teaspoons of warm water). Cover and let rise till double in bulk. When dough is ready, grease pan generously with butter, do not flour. Put a third of the dough in each pan, butter your hands, (otherwise the dough will stick to your hands). Using your fingers push dough to outer edges of pan, the dough will not want to stay there, but as you push plums skin side down into the dough, it will remain in place. Arrange the plums halves in a concentric spiral close together. Sprinkle Kuchen with the topping and dot with butter. Mix and sift sugar, flour and cinnamon together twice. Let rise for another 1/2 hour. Bake at 350 degrees for 30 to 35 minute or until sides and bottom are golden brown. Stuffed Cabbage or Sorma, is the National dish of Serbia. No feast is complete without large pots full of Sorma. 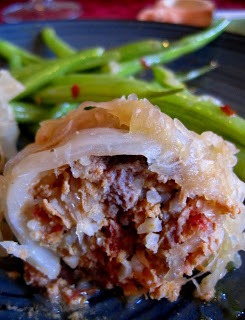 Sorma consists of tightly rolled bundles of meat and rice held together by a soft wrappers of cabbage. The rolls are piled on a bed of silky sauerkraut. 3/4 lb. ground turkey (you can also make it with all ground beef). 1 bottle or pack of sauerkraut (Do not use canned), rinsed in cold water. Brown the chopped onion in shortening, and place in mixing bowl with ground meats, raw eggs, uncooked rice, paprika, salt.Mix well with your clean hands. Take out the core of the cabbage. Leave head whole. Place in large pot of boiling water to wilt the outer leaves. You will be able to gently pull off whole cabbage leaves. Trim off thick center vein of cabbage leaves. Make a pile of leaves on your work station. You may want to shake excess water off. Place 2 Tbsp. of meat and rice mixture on a leaf (starting at the thick end) and roll it up and tuck in ends with your finger. Make as many as you can. Arrange the rolls in cooking pot. Put a few chunks of sausage here and there between the rolls. Cover the rolls two-thirds full of water, arrange rinsed sauerkraut on top, sprinkle over the peper corns and the bay leaves on top, COVER and cook slowly for about 1 1/2 hours, or until the rice is tender. We had a Hungarian feast for Jenn's belated birthday dinner tonight - Paradicsomleves with Palacsinta, Sorma, Kapros zoldbabfozelek, Gwetche Kuchen. Of course, I added my own twist to the traditional recipes! Saute pancetta in a soup pot. Saute garlic and peppers with pancetta bits in pot till soft. Add the can of tomatos and add one can of boullion. Add 1 Tbls. sugar, and peppercorns. 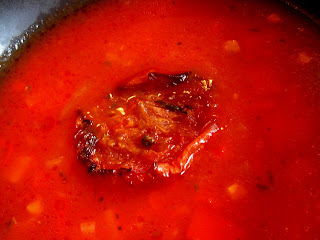 Bring soup pot to low boil, and lower heat to simmer and let simmer about 45 min. or 1hour. Serve with Palacsinta (crepes with berry jam), traditionally they are filled with strawberry jam; I used black currant. Top with powdered sugar. I have never - and I do mean never - had such gushing compliments about cupcakes before. I watched Pia stuff half of the cupcake in her mouth and moan, literally moan, which brought Brian over to steal a bite. My mom, who devoured hers right when she got back from the gym, called to say that that was the best cupcake she's ever had in her entire life; my dad, who waited till after lunch, called and said he didn't understand what my mom was going on about until he tasted it. Their friends tried one and sent a thank you email. All of the guys at Jacob's work think I should open a bakery. But the best response was from our friends to whom I have given a mini-cake for her birthday. Paxton wrote: "Marne lovessssss the cake. I have not tried it yet...waiting for her to not be guarding it." Really?!? I guess I should have tried one of these cupcakes before I gave them all away. I posted the cupcake recipe earlier. Here's the filling...8 oz bittersweet chocolate, 2/3 C heavy cream, 2 T butter, 2 t Bailey's, 4 oz marscarpone cream. Bring the cream to a simmer, remove from heat, add the chocolate, butter, and Bailey's. Let sit for 3 minutes. Whisk till the chocolate is completely melted. Then whisk in the marscarpone. Cool. And the frosting...8 T butter, 4 C confectioners' sugar, 8 T Jameson's whiskey. 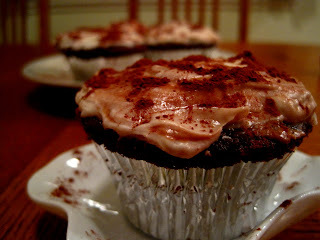 Despite their morbid name, really, how can you go wrong with a Guinness-chocolate cupcake filled with a Bailey's ganache and frosted with a Jameson buttercream?!? You can't. This might become a St. Patty's Day tradition. Preheat the oven to 350° F. Line two cupcake pans with foil liners. Combine the Guinness and butter in a medium saucepan over medium heat. Add the cocoa powder and whisk till smooth. Remove from the heat and allow to cool slightly. Fill with a bittersweet chocolate-Bailey's ganache. Frost with a Jameson buttercream frosting. Sprinkle with unsweetened cocoa powder. And enjoy with a cordial of Bailey's! Every March I wonder: why do I only make this dinner for St. Patty's Day? 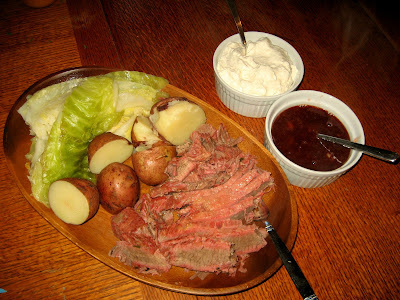 The boys love corned beef and cabbage with horseradish cream and cumberland sauce! People say that cumberland sauce is to corned beef what mint jelly is to lamb. Mine - no surprise! - is non-traditional. I add crystallized ginger for added zing. And I'm not doing it on St. Patty's Day this year because Jacob has a book group meeting on Wednesday, though I am curious what they really are doing because I know for a fact that he didn't read anything and neither did Brian! ;) So, our feast will be a day late. AND this year I am going to use savoy cabbage...because that's in our CSA box this week. Thank goodness I don't have an Irish grandmother I'll be upsetting with my bastardization of this traditional Irish meal. Camilla's Cumberland Sauce: 1-1/2 C red currant jelly; 1 C port; zest and juice from 1 blood orange and 1 lemon; 1 shallot, minced; 1 T grainy mustard; 1 t crystallized ginger, finely minced; 1 T cornstarch; 1 T water; sea salt and fresh ground pepper to taste. Bring all ingredients except the cornstarch and water to a boil. Reduce heat and cook till the jelly melts. Whisk the cornstarch and water together and drizzle into the jelly mixture. Whisk until the mixture thickens. Let cool to room temperature. The sauce will thicken as it cools.